Zermatt, Switzerland is a traditional resort with one of the most stunning backdrops of any resort (the Matterhorn), overlooked by one of the most iconic mountain peaks, Zermatt is a winter wonderland resort which non-skiers will love just as much as their skiing partners. The extensive ski area links with Cervinia, just over the border in Italy, which those on a budget may find a more affordable option. and has some of the finest skiing for intermediates and advanced. Reaching 3,820m at the highest point, Zermatt offers 200km of pistes for all abilities as well as some fantastic off-piste options. 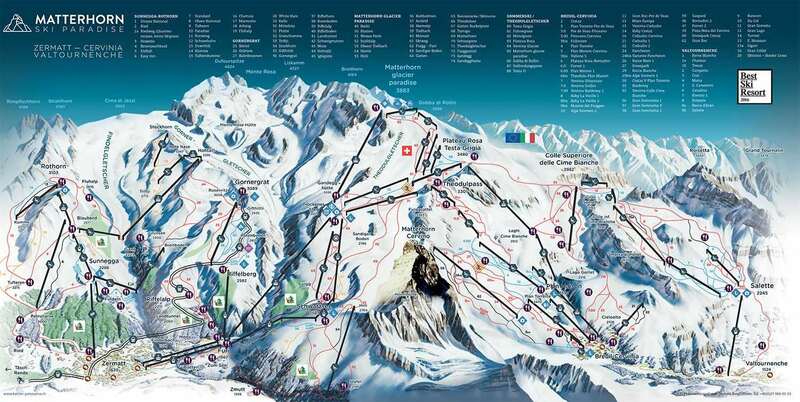 The resort is now linked with Cervinia, adding a further 150km of runs for you to explore. Beginners have the advantage of learning on nursery slopes high up on the mountain whilst Intermediates have mile after mile of red runs with beautiful views. Heli-skiing is an option for experts, as are the itineraries and off-piste routes, whilst the Gravity Park is a great option for those wanting to hone their tricks. Non-skiers can enjoy cleared walks on the mountain too, and the Klein Matterhorn has a viewing platform as well as the highest glacier palace in the world. 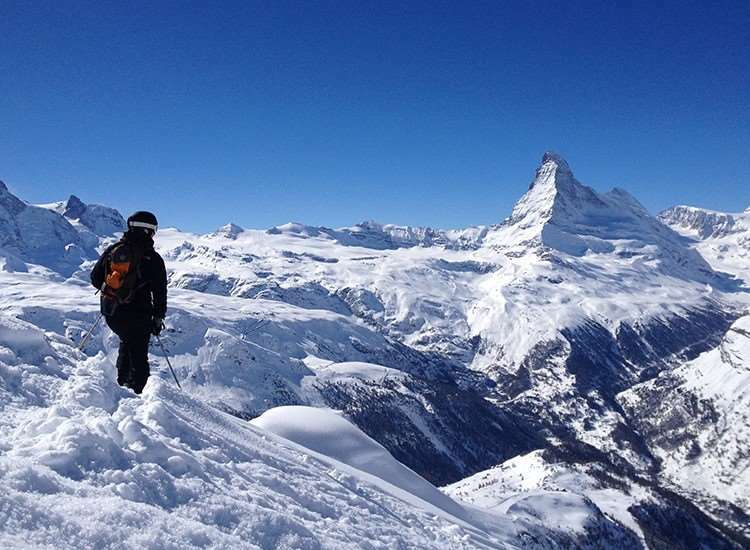 Snow coverage at Zermatt is well-known for being good, making it a sure bet for those keen on booking a holiday at a resort with consistent conditions. The pistes are also equipped with snow making facilities for further coverage during the end of the season when snow is at its lowest which mean guaranteed skiing throughout the whole season. Bahnhofstrasse, the lively main street, is lined with a fantastic variety of stylish shops, restaurants and bars. For a special dinner, reserve a table at the Michelin-starred Heimberg, or for a more low-key evening try Schwyzer Stuebbli in the Schweizerhof Hotel where you can also enjoy live Swiss music from 5pm each day. Warm up by the fire at Chami Bar in the Pollux whilst enjoying a glass of wine or perhaps a glass of Swiss Highland single malt whisky! Arriving by train, the only transport options in the car-free town are electro cars or beautiful horse-drawn carriages which add to the winter wonderland appeal. Zermatt is in a valley surrounded by the most spectacular scenery. The transfer to resort takes around 3.5 hours from Geneva airport as the only way in is via the train from Tasch. All transport in the town is by electric taxi or bus. This is a real community where people live and work, not just a ski resort, so there is a bustling main street with shops, hotels, restuarants and bars. The Matterhorn museum is worth a visit if you are interested in mountaineering. Probably the best resort in the Alps we have been to for mountain restuarants; there are some self service ones at the top of the Sunegga lift and at Trockensteg, in my opinion the best ones to go to are the smaller ones. I would recommend the Adler at Findeln, amazing views and very tasty barbecued chicken. There is a large ski area, not really suited to beginners, with lots of long red runs and roads through the trees. The runs are pisted every day but can get full of moguls if you are a motorway skier. There are challenging yellow runs for the more adventurous skier. It can be very cold and windy at the top of the glacier. Al in all this resort offers everything you need and the views of the Matterhorn and Monte Rosa are stunning!